While mapping Justin Bieber’s hometown of Stratford, Ontario, Canada last year (2009), Google Street View car did not find Justin Bieber at home. 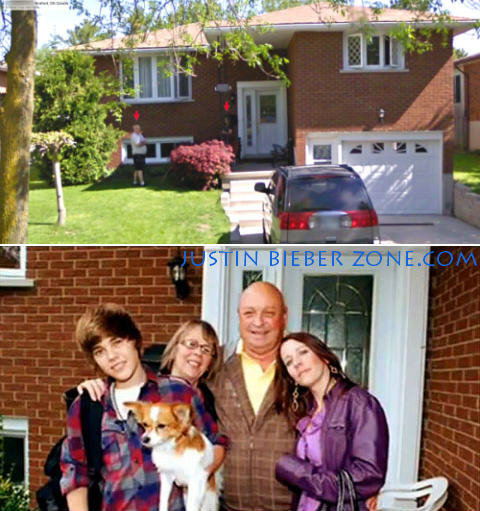 However, Justin’s grandparents were captured in front of the property, as seen above (top image). hi,im from malaysia,and i like all of songs from you..
hi,justin where is you new house now..
i will come canada and new york..
I’m from Belgium and follow a while bieber s perfomance. and i’m father of a 5year’s daughter that like his music and videos that much. She like also dance and next year go to play piano. one day she didn’t understand why he can’t go to Belgium?? i answer her that maybe he gonna think of you. but his buzzy with his performance and singing. so i didn’t also had the answer. normally i speak dutch of French and my English is basics. thanks by advance. hi, im fr0m pakistan, and i like al s0ngs of justin. HI JUSTIN I AM NTASHA I AM YOUR BIGTTES FAN IN WHOLE WIND WROLD AND GUSS WAHT I AM COMING TO CANDA TO SEE YOU AND I HOPE YOU AER HOME IAM COMING NXT YEAER . FROM NTASHA . i really love you but please leave my grandparents out of this. they have to move out of Stratford if all my fans know the adress. I wish I was outside mine when the van came by!!! Justin i am your biggest fan. I am 8 years old. I have your posters all over my wall. I think its wrong you guys want to know were they live Justin Does not live there anymore hes in the us!! You have to respect his grandparents! And they may of lied about the top photo it might not have been the same! can u give juwtin bieber number fon? Omg! whats the address to this house? i think justin is beyond amazing and he is soooooo talented. saw him on saturday the 18th and he looked right in my eyes and waved at me when he walked around the backstage area. legit. I have no clue what’s the address 2 his grandparents house. awwwwwww thats a nice house and a nice pic of his family too!!! sooooooooooo nice.love ur doggy justy.